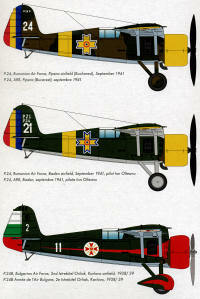 The Bulgarian Air Force ordered 14 PZL P.24Bs in 1937–1938. It later ordered 26 PZL P.24Fs, 22 of which were delivered from Poland in July 1939, just before the outbreak of World War II. The remaining four, lacking propellers, were bombed in the Okecie factory in September 1939 by the Germans. The Romanian Air Force already used PZL P.11Fs built under license in the IAR factory, and decided to acquire the P.24 as well. Romania bought five P.24Es and a production license, and built 25 IAR P.24E aircraft at the IAR factory between 1937 and 1939. Some components of the P.24E, mainly its tail section, were used in construction of the Romanian low-wing fighter IAR 80. The fighters were used to guard Bucharest and the Ploieşti oilfields from Soviet bombers at the start of Operation Barbarossa. Flying from Otopeni military airbase, the PZL P.24 fighters managed to shoot down 37 unescorted VVS bombers. The P.24E was also used for ground attack missions until the end of 1941 and after 1942 it was relegated to training duties because of its obsolescence. There have been several P.24 kits in 1/72 from a variety of manufacturers in both injected plastic, resin and vacuformed plastic. Your editor built one of unknown origin 20 or more years ago that was rather crude, to say the least. This particular kit puts all previous efforts to shame. The kit is superbly molded by our friends at MPM as part of their Azur series and allows the builder to complete either a P.24B or a P.24E. The major difference in these two is the shape of the cowling as both are powered by two row Gnome-Rhone 14 cylinder radials. This was an extremely popular French engine of the time and powered a staggering number of aircraft, including several wartime German planes such as the Hs-129. The kit comes on two grey injected sprues with a clear sprue for the one-piece canopy. There are also two vacuform canopies for those who want to cut the canopy open. Several resin sprues contain exhaust, oil coolant radiators, engine gearbox hub, machine guns, shell ejector chutes and some other very small items. The etched fret includes the straps that go over the radiators, trim tabs, control hinges, seat harness, rudder pedals, and a few other detail items. 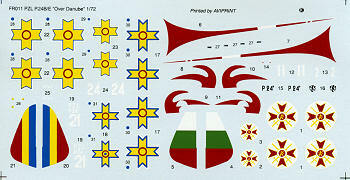 Since there are two variants offered in the kit, the differences between those two have been taken into account. The B version will have the shorter, more rounded cowling, wheel pants, three bladed prop and the added shields to the back of the exhaust. For the spatted gear, only lower wheel bits are provided and can be added late in the build if one wishes. There are armament differences as well so you really need to choose the variant you will be building early in the construction process. A few things I noticed. One is that there are ejector towers on all the large pieces. This means the inside of the fuselage and the inside of the upper and lower wing halves so you will need to remove those. I was also impressed at how well the corrugated surfaces were done. Thankfully, these co rrugations do not extend over the wing leading edges. I also noticed that there are no pushrods on the engine, nor do the instructions show these needing to be added. It will add a lot to the engine if these are added; at least to the front row, but it is your choice. This would have been a nice p.e. or resin addition. Instructions are very well done with several detail drawings to show alignment. Any modification nee ded is clearly shown as are any optional bits. The gear legs will require some rigging so be aware of that need. The markings are provided for three aircraft. One is a pre-war Bugarian AF version with a large red speed stripe and cowling in Dark Green over Light Blue. The two Romanian versions are quite similar in Dark Green and Dark Earth over Light Blue. These both carry Eastern Front markings consisting of a yellow fuselage band, lower wing tips and cowling. The big difference is the style of insignia. The decals are superbly printed; very crisp and in register. 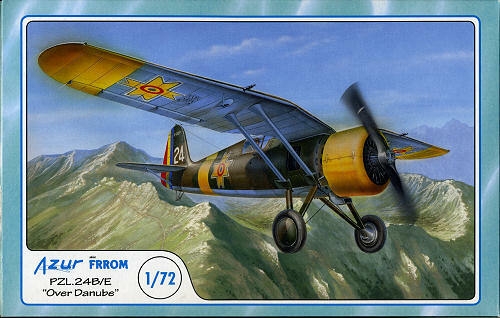 If you are a fan of these aircraft or just want a nicely done kit of a semi-obscure central European air force, then I can easily recommend this one to you. Thanks to www.westcoasthobbys.com for the preview kit. Order yours today.